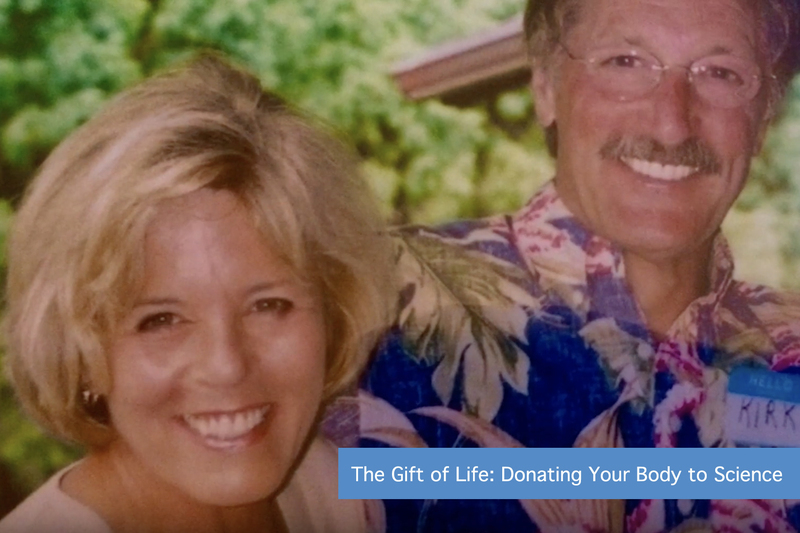 Pictured: Linda Coble with her late husband, Kirk Matthews. Photo courtesy of Linda Coble. Linda Coble, Hawaii’s first female television news anchor, sat down with HI Now Daily to discuss the decision of her late husband,. Kirk Matthews, to become a part of the Willed Body Program at the University of Hawaii (UH) John A. Burns School of Medicine (JABSOM). Her quotes from that interview are used in this story. The veteran journalist-duo is also well-known throughout Hawaii for being active and longtime members of the Rotary Club of Honolulu. Putting “service above self” and volunteering seems to have been a natural part of their lives. In fact, Matthews, TV anchor and reporter, would always end his newscasts by saying that we should all “take care of each other.” Through the Willed Body Program, he was able to do just that. The couple met in 1981 while working at news station in Oregon. Soon after, they were engaged, moved to Hawaii together and were married for 33 years. Matthews died in 2016 after battling stage 4 lung cancer. An orchid lei honors a loved one. Amanda Shell photo. Every year, JABSOM holds a memorial service to honor the willed body donors and their families. Coble was touched by the heartfelt displays of appreciation from the medical students to their silent teachers. “It’s so wonderful to see them (medical students) share how valuable that last moment that they had with our loved ones– how important that was to them and how much they learned,” Coble said. The service is followed by the medical students paddling out to sea near Magic Island to scatter the cremains, for those who requested it. The donors’ loved ones are able to watch and say their final goodbyes as the music of bagpipes playing mixed with the sound of crashing waves fills the air. This year’s Annual Memorial Service will be the program’s largest– with more than 870 attendees expected. 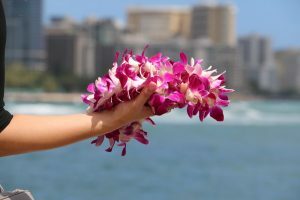 The public scattering of the cremains on April 13, will occur offshore of the Waikiki-end of Magic Island. The canoes will launch at 2:00PM.